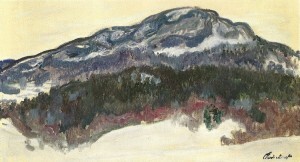 Claude Monet spent two months in Norway in the winter of 1885 painting 29 snowy scenes and experimenting with lighting. Jacques Hoschede, Monet’s step-son, married a Norwegian woman and lived in Christiania (present-day Oslo) so in February 1885, Monet visited him. Monet enjoyed visiting sites beyond his beloved garden and Giverny. A trip to Scandinavia would give him the opportunity to paint, “the fearsome north” and experiment with lighting effects on snow-covered scenes. Hoschede took Monet to an artists’ colony south of Christiania, the fjordside village of Sandvika. 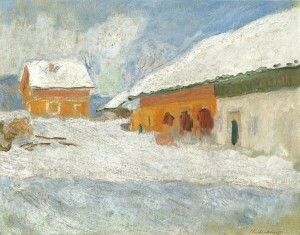 It was here that Monet created many landscapes of the village and Mount Kolsaas. Monet likened this mountain to Mount Fuji which he was familiar with from Japanese woodblock prints. Monet found the snow to be a bit much. He wrote saying, “This country is undoubtedly infinitely more beautiful without snow, or at least when there isn’t so much of it.” Monet’s inability to ski made discovering beautiful landscapes much more difficult so he had to travel by foot or horse-drawn sleigh.